The mangrove channels and shallows are a perfect environment to explore by kayak or paddleboard. 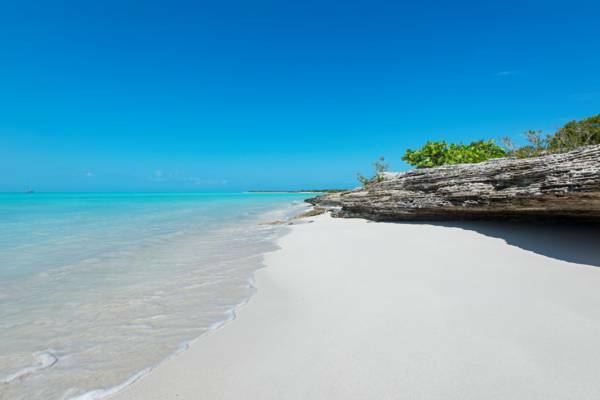 This area is an expansive and largely inaccessible nature reserve on the west coast of Providenciales. Kayaking and paddle boarding is excellent in the mangrove wetlands, but due to the remote location and potential crime risk it’s recommended that arrangements are made through a local watersports business familiar with the area. The vast majority of the interior wetlands of Frenchman’s Creek is quite shallow, but bottleneck channels are often deeper due to the water movement caused by tides. Frenchman’s Creek and Pigeon Pond Nature Reserve is the largest section of protected land on Providenciales and covers an area that’s roughly two by four miles. Several different types of local terrains are represented here, including mangrove wetlands, sandy beaches, sea cliffs and inland saline ponds. Unfortunately, there aren’t really any roads into the bulk of this nature reserve, so the main interior and much of the coastline is difficult to access and not really feasible for causal visits. This sanctuary is a haven for a wide array of wildlife, including Giant Blue Land Crabs, sea life and many types of birds. Frenchman’s Creek has evidence of previous industry. Stumps and worked lumber show that many of the larger trees in the area were cut down, most likely to be made into fittings for ships as although the trees found in these saline marshes never reach great heights, their wood is often quite strong and extremely resistant to rot. In another area, burn mounds are probably the remains of charcoal kilns, or possibly a production site for cement, which used to be made by burning and crushing conch shells. Examples of old glass bottles found in the area suggest that these events happened between the early and late 1800s. Pigeon Pond in the Frenchman’s Creek and Pigeon Pond Nature Reserve. Pigeon Pond is a land locked hyper saline shallow body of water found on the northeast end of the nature reserve. Although difficult to access, the area has unique rock formations and at times has large numbers of bird life. 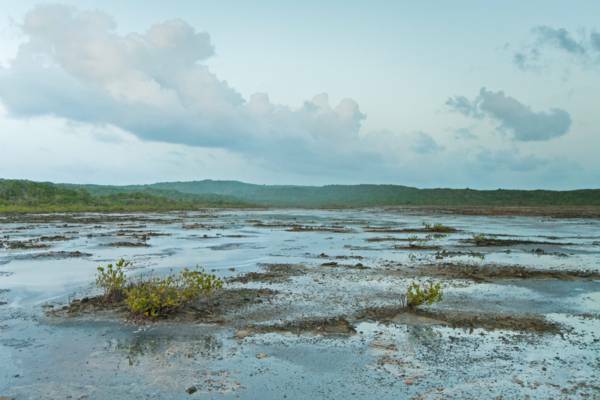 During the dry season, expanses of mud flats are exposed when the water level gets low. Juvenile Lemon Shark in the wetlands of Frenchman's Creek. The southern half of this nature reserve is a maze of mangrove trees and shallow channels of water. 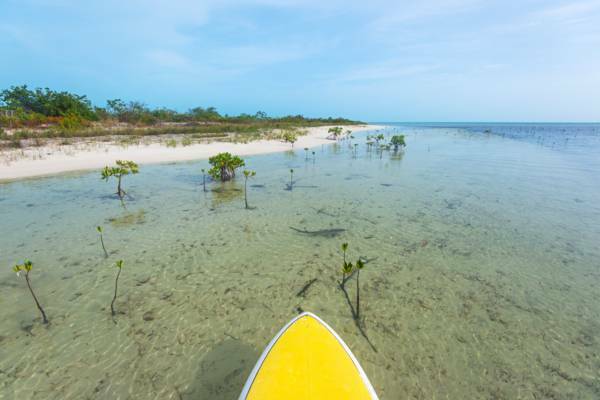 Small lemon sharks, bonefish and conch are plentiful, and the area is great for kayaking or stand up paddle boarding. Conditions are good when wind speed isn’t too high, but be aware that there can be currents in some of the channels when the tide is going out. The best spot for launching is found about four and a quarter miles down the road (Tom Lightbourne Road) to West Harbour Bluff. The beautiful beach at West Harbour Bluff in the Frenchman’s Creek and Pigeon Pond Nature Reserve. West Harbor Bluff is the southwest point of Providenciales and is also part of the Frenchman’s Creek and Pigeon Pond Nature Reserve. A cave, 200 year-old rock inscriptions and limestone sea cliffs are found on this small peninsula. An unpaved road leads out to West Harbor Bluff, but some stretches can be quite rough for small rental cars. To the north of West Harbour Bluff is the secluded beach of Bonefish Point. 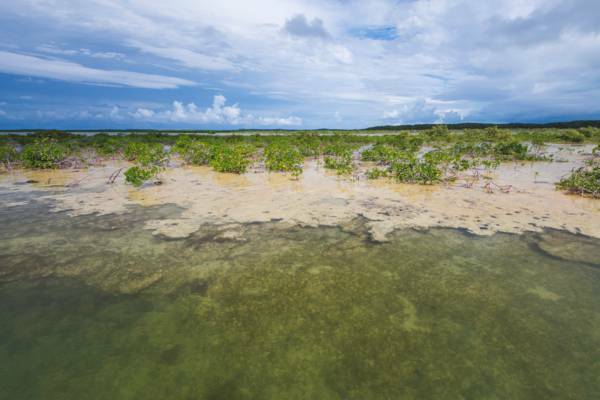 Frenchman’s Creek and Pigeon Pond Nature Reserve is the largest section of protected land on Providenciales and covers an area that’s roughly two by four miles. Several different types of local terrains are represented here, including mangrove wetlands, sandy beaches, sea cliffs and inland saline ponds.